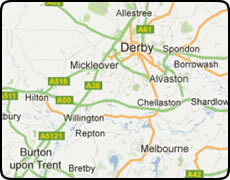 Derby Oven Cleaning are a family run oven cleaning company covering the Derby area including Oakwood, Chaddeston, Spondon, Oakbrook, Borrowash, Draycott, Breaston, Risley, Ripley, Elvaston, Thulston, Shardlow, Alvaston, Chellaston, Sinfin Littleover, Mickleover, Heatherton Village, Markeaton, Mackworth, Darley Abbey, Allestree, Little Eaton, Duffield, Belper, Burton on Trent, Castle Donnington, Kirk Langley, Ilkeston, West Hallam, Burnaston, Breadsall, Willington. Working for domestic homeowners as well as property landlords, letting agents, and many commercial kitchens and restaurants from around the Derby area we offer a service that can restore even the grimiest, greasiest oven to near showroom condition. Its oven cleaning at its best!. Get a Oven cleaning quote online or call 07760 281510 . Our oven cleaning prices are low with prices from just £40. Why not give us a call on today 07760 281510 and we will have your oven looking and smelling cleaner in no time. As a family run business we are known for offering a reliable, affordable and fully insured oven cleaning service. Our fully trained and courteous staff work to the highest standards, and always treat the your home with the upmost respect. Derby Oven Cleaning are most able offer oven cleaning in the following Derby areas: Oakwood, Chaddeston, Spondon, Oakbrook, Borrowash, Draycott, Breaston, Risley, Ripley, Elvaston, Thulston, Shardlow, Alvaston, Chellaston, Sinfin Littleover, Mickleover, Heatherton Village, Markeaton, Mackworth, Darley Abbey, Allestree, Little Eaton, Duffield, Belper, Burton on Trent, Castle Donnington, Kirk Langley, Ilkeston, West Hallam, Burnaston, Breadsall, Willington.